In early 2012, I made it a goal to try and achieve $200,000 a year in passive income by 2H 2015. The idea was to somehow make a large enough sum of money to comfortably provide for a family of three or four in Honolulu or San Francisco. With $200,000 a year, I wouldn’t have to go back to work ever again. Instead, I’d rest easy working on building Financial Samurai into a lifestyle business. Creating a lifestyle business has always been a dream of mine because it helps mix entrepreneurial passion with the ultimate end goal: living a better life. Killing myself for the next 10 years to try to make something huge in order to live a nice life sounds a little backwards. Why not live a nice life now? Growing passive to semi-passive income from ~$78,000 in 2012 to $200,000 is a daunting task, especially given our low interest rate environment. But when we write out our goals, I firmly believe we’ll figure out ways to eventually get there. Let’s see if I made it or not! I’m sorry to say that I’ve failed at achieving my $200,000 a year passive income goal by 2H2015. If I stayed at my banking job, I would have earned a lot more money and hit my target by now. However, I took a risk and left a steady paycheck to just live off of the then $78,000 a year in passive income and the uninspiring money I made online. But looking back, I am absolutely ecstatic that I decided to start my own website in 2009 because my online income has now far surpassed my passive income that has taken over 15 years to build! But making money online is a topic for another time. Here’s my latest passive income for 2016. I use Personal Capital’s free financial tools app to track my 32+ financial accounts. If I didn’t, I’d go crazy and miss things. It’s like having a grocery list to keep track of what to buy and not having a grocery list for a party. The former is much better. CD interest income is down to roughly $19,920 from $21,000 a year ago because I cashed out one CD and used the proceeds to pay down debt and buy another property. Two CDs expire in 2017 with an interest rate of 4%, and one CD expires in 2018 with an interest rate at 2.6%. In retrospect, locking up money in a 5-year CD at only 2.6% was a poor financial move. But, I’m happy to invest money at a 4% risk-free rate all day long. Please read: Should I Buy CDs In A Stock Market Correction? Despite having a hefty amount in CDs, I’m still aiming to maintain a $100,000 liquid savings account earning just 1% for future investment and insurance purposes. Opportunities always come up, and I want to be prepared to deploy $20,000 – $50,000 slugs at a time without penalty. Dividend income has risen to $24,912 a year from $21,360 the year prior. The main reason is because my portfolios have all grown due to performance and contribution. I’m also building up my muni bond and bond positions after they sold off in 2015. 2016 is a rock year in the stock market, and I want to focus more on stability. My investments are still very growth oriented because I’m looking for hopefully faster capital appreciation. For example, stocks I own like Netflix and Tesla don’t pay any dividends. If I wanted to optimize my portfolio for income, I could probably earn $45,000 – $55,000 a year in dividends. But as someone who is still relatively young at 38, with other income sources to pay the bills, I’m willing to take more investment risk. Once you accumulate a large enough nut, then go heavily into dividends if you need the cashflow. The real estate category is where I’ve made some good strides. Total estimated annual income rises to $100,322 from $88,332 due to three main factors: 1) I increased the rent of my single family house (Rental Property 1) after spending about a month trying to find new tenants after my old tenants decided to cut the lease short by 1.5 months. It was a PITA but I was effectively able to raise the rent from $8,700 to $9,200 a month and keep my 100% occupancy record for 10 years in a row on two properties in SF. 2) The second action was finally paying off my condo rental property mortgage (Rental Property 2). 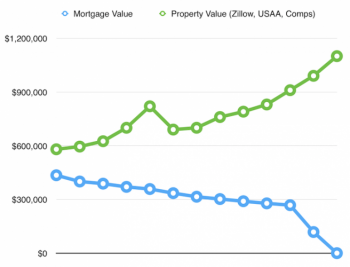 The monthly PMI mortgage was $1,308, $200 of which was principal. I also increased the rent by $200 to $3,950 after two years of keeping rent steady at $3,750. The master tenant is fine. She just hasn’t been able to hold down a roommate for longer than a year, which has caused a lot more work and fines. This property could easily rent out for $4,300 – $4,500 in today’s market. As a result, if there is another roommate turnover, I will be raising the rent when her year lease is up in June to $4,300 instead of $4,050 as I was originally thinking. I may even consider selling the property next year to simplify life. Finally, my Lake Tahoe vacation rental is slowly recovering due to the rising Bay Area population and strength in tech and internet. There are over 100,000 more employed people in the Bay Area than five years ago. Napa Valley and Lake Tahoe are like the Hamptons of New York, and money eventually finds its way here when disposable income increases. El Nino has finally arrived, bringing with it record snowfall in 2016 so far. Other income will improve to roughly $30,000 from $19,876 mainly due to an investment in a new Venture Debt fund, slight growth in my severance negotiation book sales, investing more money into P2P lending with Prosper. The biggest opportunity to create more value is through my severance negotiation book. I’ve updated How To Engineer Your Layoff to a second edition with 50 more pages (50% larger). I’m also experimenting with price, raising it from $48 to $55, $65, $75, and $85 to test out elasticity of demand. Currently, the book is now priced at $85 with a $10 holiday discount. It has seen no drop off in demand so far. The lesson learned is to always test, test, test. The book has resulted in more than a dozen 1X1 layoff consultations at $500 for 1.5 hours. I’m pleased to say that every single client walked away with at least $10,000 in severance. One walked away with over $500,000. I’ve committed $94,000 in a friend’s Venture Debt fund so far, with another $56,000 in capital contribution within the next 12 months. The preferential interest is 9%, hence $94,000 X 9% = $8,460 a year in interest income. My Venture Debt investment is unproven, so this income stream is not as certain as my other income streams. The real returns should be closer to 12% a year, but we shall see. I’m going to start contributing $10,000 every six months into my after tax portfolio. They’ve got a great feature where you can automatically contribute to your portfolio every month just like your 401k. They’ll buy your positions based on existing weightings for you. The first six months was a test to see how things would work out. So far, so good spending $9.95 building 30 positions and watching them outperform the market with a year-to-July 16 performance of ~5%. I do everything in baby steps. Finally, it’s been close to three years since I first started investing in Prosper. 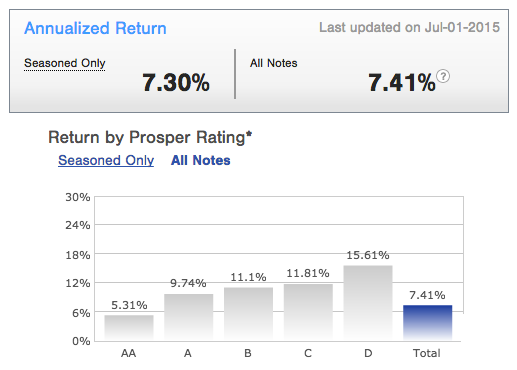 My performance investing in the most conservative loans is a 7.41% annual return, which is great. As a result, I also plan to invest another $10,000 every six months into Prosper, starting now. I finally feel very comfortable with P2P lending after learning about the sector for the past six years. In a rising interest rate environment, you want to be a lender of money, not a borrower. As a result, Prosper is also one of the biggest money making opportunities for 2016. Prosper three year annualized performance. Little volatility, steady gains. 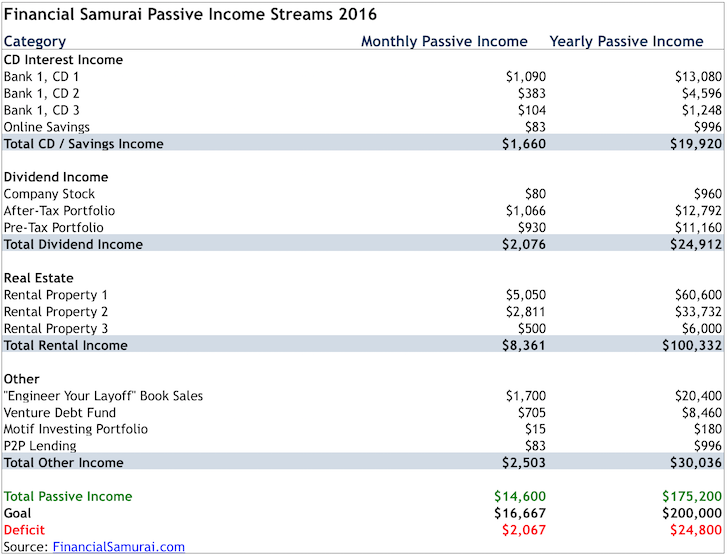 Online income is not passive, which is why I don’t include online income in my annual passive income reports. It takes a long time to write articles, test out products, highlight products in a value-added way, negotiate deals, and maintain the site. If I wanted to cheat, I guess I could include 50-75% of my online income as passive income since 71% – 75% of my traffic comes from search engines. I also did a calculation that 1% of all posts on Financial Samurai generates 32% of all traffic. But what’s the fun in cheating? Besides, search engine traffic is out of my control and my traffic would probably decline beyond the 75% if I stopped writing. It’s much better to keep online income separate from passive income so I can better optimize both. It’s true that my online income can provide a comfortable lifestyle for a family of four here in San Francisco. However, I’ve been writing three to four posts a week for the past seven years now. Heck, I even spent 25 hours being an Uber driver in order to write a first-hand account of the ridesharing economy! Not even Uber employees are willing to be Uber drivers! That is some serious due diligence for an article that may never generate much income at all. If you have an idea for a site, definitely register one online and start (step-by-step tutorial). It costs less than $4 a month to host and it’s easy to link up your WordPress.org account. I never imagined starting a site would enable me to break free from Corporate America after only two and a half years. At the very least, build your brand online by registering your name. Why should only LinkedIn, FB, Twitter benefit from you? Control your own destiny. With an online platform, you can get consulting opportunities like I’ve gotten that pay more than $200,000 a year combined. Your online platform can also sell products you’ve created, or make your advertising income. The possibilities are endless! Despite taking a lot of actionable steps to improve my passive income, I’m still $25,000 a year short of my goal. With the risk-free rate at close to 2.5%, I need another $1,000,000 in capital to make up for the short fall if I’m to stay conservative. If I didn’t challenge myself to the $200,000 a year goal by 2H2015, I’m not sure I would have even broken $120,000 a year by now. I’d probably buy a fancy car or blow myself up by actively day trading the stock market like I used to. Now that my online income has grown, I’m confident the $200,000 a year goal can be met by the end of 2017. The whole goal for building passive income streams is to give yourself optionality. There will inevitably be a day when you no longer want to do your job. If you can build your passive income streams while you are still enthusiastic about work, you might be able to time the fade perfectly. There’s an old Chinese saying, “If the direction is correct, sooner or later you will get there.” It’s time to get started already! 1) Write out your goals and start building passive income now. In 10 years, you won’t regret the actions you take today. 2) Invest in what you know, but also consider diversifying your passive income streams. Having 100% of your net worth in dividend stocks or 100% of your net worth in rental properties could pose problems in the future. 3) Your risk-free money shouldn’t just sit in a savings account. Treasury bonds and CDs are your best alternatives. At the same time, keep six months of living expenses liquid just in case of an emergency or a salivating investment opportunity. 4) Every investment has an opportunity cost. Therefore, the ultimate way to generating more passive income is to produce more products. You’re going from nothing to something. The internet makes things so much easier to sell nowadays, which is why you should launch your own website. Once you have your own platform online, you can leverage it to find new consulting gigs, brand yourself online, find new work, sell products, and make advertising revenue. There are three billion people online today. 5) Keep your passive to semi-passive income separate from your day job income, one-off investment gains, or business income. You will grow your respective incomes much faster this way. Updated 2019: I’m strongly focused on building passive income through real estate crowdsourcing platform, RealtyShares. Unfortunately, RealtyShares is no longer accepting new investors on their platform. I suggest taking a look at Fundrise, the pioneer in eREITs. They are also currently working on an Opportunity Fund to take advantage of tax-efficient Opportunity Zones. Fundrise was founded in 2012 and is open to all investors – accredited and non-accredited alike. Hello all, i am saving about 20% of my six figure income towards retirement. My wife and I are maxing out our 401ks. We are very grateful for excessive monthly cash flow (from work) and cash reserves. Would like to start investing in some passive income, but don’t know where to start… Have a year of emergency funds in a “high yield” checking account. Started dabbling in P2P. Have about 20k in car debt and student loans (which I could pay off). Where do I start? Very broad question, but any insight would be helpful. I was wondering if you could provide more detail on the real estate, as this seems to be never detailed whenever folks talk about real estate, so I’m always left wondering. For real estate, what basis do you use for, say, asset allocation. Gross value, gross equity (value minus debt), or net equity (value minus debt minus liquidation costs)? For real estate “income,” are you measuring rents, rents minus expenses (including interest), or rents minus expenses (including interest) minus principal too? I’d like to hear the basis for asset allocation answer too. And what about real estate income – are you factoring out maintenance and potential vacancy? Are you adding back in principal pay down, tax savings, or annualized appreciation? There are a lot of online savings accounts that offer 0.75% to 1.1%. Check out Capital One 360 Savings. Interesting…I’ve been with Schwab for a while because of no ATM fees on checking and came over years ago because of better savings yield. Looks like Everbank handily beats them in these respective areas. I need to look into discontinuing my banking portion with them. Do you recommend a brokerage firm? To hold stocks, index funds, etfs, etc. How did you find my site to begin with? Always curious to know. I really like building my own portfolio with Motif Investing because you can build a 30-position portfolio for $9.95, and rebalance all 30 positions for $9.95. The first trades are free too. I like them so much that I decided to consult with them on the content marketing initiative since December 2014. They have the most disruptive fintech idea imo. I also like Wealthfront for most people who are happy to have an algorithmic advisor run their money. They charge 0% for the first $10,000 and only 0.25% for every $1 over $10,000. In the long run, it’s all about time in the market, and having the proper asset allocation. I used to trade with CS, but it’s just too expensive. Yeah, I just went through that realization myself about Schwab, and moved the bulk of my cash to Synchrony. (See bankrate.com) However, I’m moving a lot back out to pay down various rental mortgages. Better to reduce ~3.125% debt than to save at a taxable ~1.1%. I have a ton of PALCOs, too, so better to tap into RE income. My general plan (at the moment…) is to only invest in equities in my IRA and 401k, save my emergency cash in Synchrony, have a 0 balance HELCO on standby, and put all excess cash to pay down rental mortgages. How are you getting 1% on your 100k in liquid savings? I think I am getting 0.1% in my high yield savings. Awesome detailed report on your many sources of passive income. Looks like you have tapped all the major categories for maintaining passive income streams. For now my focus is just on dividend income but I am open to P2P lending and possibly writing options as well. Would be nice to see your detailed stock portfolio besides the Motif. Thanks for sharing. Amazing..that’s all I have to say. Just because you didn’t hit your goal doesn’t mean it was a failure. As you said, the goal pushed you to get to where you are today, so without pushing yourself you would be further in the hole. I love how diversified your income stream is. As you said, it probably isn’t a great idea to only receive income from dividend stocks. We are starting to diversify with revenue from our website which is great, but we have yet to dabble into real estate or some of the other streams you mentioned in your article. This is all one fun journey though, so you have to start somewhere. Hopefully we are able to produce an ambitious goal for our business such as yours that will send us to new heights. And as we discussed on our website, we would never complain about more frequent progress reports haha Keep up the amazing work and keep on inspiring others like us to dig deep and relentlessly pursue financial freedom. Nice job with the start of diversification! I didn’t realize there was such a big dividend investing niche. Why do you think that is? I’m more of a growth investor for principal appreciation myself, but I do so the obvious benefits of dividend investing. Maybe I’ll start updating my passive income and dividend portfolio twice a year instead. Sam – this is both impressive and inspiring. It’s helpful for folks like me to ‘look at the grown-ups’ and see what is possible. It helps with goals setting too, for something that is both challenging but realistic. One question though: if Prosper provides such good returns, at 7%, does it make sense to keep investing in Motif or the stock market in these times of low interest? Hey, there. I’m fairly new to your website but enjoy the content and your matter-of-fact style of writing. I work in real estate investment (invest on behalf of family offices and high net worth investors), and it recently occurred to me that while you invest in P2P lending, you haven’t invested with real estate crowdfunding sites which claim to yield better returns than the ~7% you’ve achieved via P2P. I’m wondering if this is due to your current exposure to real estate via direct investment or whether you’ve had a bad experience. Do you know others that have invested with these RE crowdfunding sites and whether there’s substance there? Any perspective would be great. Welcome to my site! Feel free to subscribe via the top buttons on the right. I’ve got about 40% of my net worth in direct real estate investments in SF, Lake Tahie and Honolulu already, hence, I don’t want any more RE exposure. I recently paid off one of my mortgages and want to grow my other assets so RE becomes no more than 25% of net worth. Classification: Uber Employees are not allowed to drive for Uber. There’s that fine line between employee and contractor, and the company does not want to blur it, so it became company policy to not allow it. Source: interviewed with Uber and asked how many of them have actually driven for Uber – received this response. Do you have any posts on how to go about selecting a income property to buy ? What’s the most important aspect cash flow, capital appreciation etc.? I know it’s the right thing to do but I have always been hesitant to invest in an income property because I am not sure on how to go about selecting one. What Type Of Investment Property Should I Buy? SFH, Condo, or Multi-Unit? It takes a lot to get $200K in passive income. I manage my rentals myself, and that helps, but it is not passive. I like the idea of $200K, I am about as close as you are, just slightly more active (although taxed as passive). Sam, considering we live in a “sue everyone” society how are you handling your rental properties? Do you have a large umbrella policy or do you have your rental properties in individual LLCs? An umbrella policy is a must. I have one, and so should anybody else who plans to build wealth over time. I’ve also spend a lot of time research and developing as strong of a rental lease as possible. Here is a sample lease that I’ve published on my site. Finally, I do own an S-Corp, but I have not structured it as a conglomerate like Alphabet, and Google, yet. Maybe one day. How about you. What do you do to protect yourself from liability? Congrats on your progress and thank you for sharing. Have you looked at all at condor, iron condor, or iron butterfly option strategies for semi passive, non market correlated cash generation? After moving through learning periods and subsequent investment in stock, bonds, real estate and P2P and I am experimenting with a small allocation of portfolio and would be curious to hear your thoughts. I have not. But Crouching Tiger, Praying Mantis, and Bear Claws, yes! I’m a real estate investor in Seattle and stumbled across your website while writing an article comparing stock investing and real estate investing. I find your site extremely useful with a ton of great content. In addition, we are the same age with identical financial goals. 1. What is your lifetime earnings to date? Your income stream from CDs alone implies a pretty substantial principal invested. You either had a high income, or low burn rate, or combination of both.. Regardless, very well done! 2. I’d love to see more details around how you’ve grown your income over time. For instance, how did your income change from ’01 to ’02 to ’03, etc. Just the rough numbers if they’re available. 3. I was a software developer for 8 years before getting my MBA at MIT. I’m now working in sales which pays the bills but commission checks are spotty. In addition my quant skills are hardly used (if at all). I’m thinking about switching careers into finance but sounds like this might be a rough career path. What are your thoughts around this? If you can get a job in banking or private equity or at a hedge fund, I’d take it. The pay really is pretty good for what the job is. A third year VP can easily make $500,000 for example. How about yourself? What is your current income and net worth? My net worth after graduating business school in 2011 was actually negative due to the loans I took out. But since we were always interested in real estate, my wife and I decided to take the plunge and purchase rental property. So in 2012 we bought our first rental, then a couple more in 2013 and then more in 2014. Looking back, that we couldn’t have timed the market better! The appreciation from the properties alone has pushed my wife and I over the $1m net worth (as of a few months ago). We plan to keep investing in real estate throughout the Seattle area simply because we believe it will become the next San Francisco (most of the major silicon valley tech companies are opening satellite offices here, and a lot of the larger tech companies are hiring like crazy). We are also long term investors looking for passive income. What I enjoy about your site is the idea of making your money work for you, which is exactly the position we want to be in 5 to 10 years from now. Great posts and keep up the awesome work! Btw, I travel to San Francisco a lot for business and would love to meet up. I did a stint as a driver with Uber here in Seattle and almost turned it into a full time business by hiring other cars/drivers. I’ve got other business ideas and would love to run them by you! Beavers and Bears working together. Imagine that! But I did buy a pretty neat little fixer with panoramic oceans views on two levels in early 2014 that has so far done well. I’ve been busy building a master bathroom and creating a sanctuary to add value. Building passive income takes a lot of time given how low interest rates are. But, if one keeps at it over the next 10 years, the money will become meaningful. Speaking of Uber, I just wrote a post entitled, “How To Make $100 / Hour Driving For Uber“. Not sure if you saw that. But, the key is developing a platform! So, more than 1/3 of you monthly passive income comes from a single rental property? If it burned to the ground tonight, what would be the consequences to your lifestyle & net worth (would your insurance cover _all_ expenses to rebuild)? Having nearly 60% of your passive income dependent on personally-held real estate seems a risky strategy. I wish this property that is now debt free was 1/3rd my total passive income. Unfortunately, I’ve got to pay property taxes, maintenance, and HOA. Hence, the percentage is closer to 22% before the write backs for tax benefits. Now you know why I’m shooting for $200,000 in passive income, so that if this property burns to the ground and I can only collect ~$600,000 from the insurance co, instead of the $1-1.2M in market value, I’ll be able to survive off $170,000 in passive income and the $600,00 in insurance co proceeds. This is also the reason why I’m trying to raise as much cash as possible, and build my business, which luckily is more than my current passive income after six years of work. I’m not delusional to the point where I think any of this will last indefinitely. Looks like you have a lot of experience with property and other passive investments. Can you share what types of investments you have accumulated and how much you’re currently generating? What tips would you have for me to help minimize risk and maximize exposure? How old are you any how? Thanks! I’m 25 years old, living in LA/OC and haven’t graduated from college yet. I am planning on going to grad school and do something similar like a residency that will take 2 years to complete; a total of 3 years when I will be done and be able to work in my professional field. I would like to retire comfortably around the age of 60, even earlier if I can. I have over $10,000 saved up and can save around $10,000/year (I recently started saving less than a year ago). I don’t have to worry about rent or mortgage because I live at my parent’s property for free. My mom also told me she will take care of grad school funds but will not be able to work for those 2 years (I will have around $17,000 saved up by then). I’ve been a reader on and off for a couple of months now (I recently signed up for your newsletter so hopefully be on here more!) and was wondering if you can help me jumpstart my retirement plan? I am fearful that I will not have enough funds to retire comfortably and would like to built a passive income like you; however, I don’t know where to start! I’ve looked into P2P lending, put options, and Roth IRA. I don’t know where to start! Eventually, I will like to invest in real estate. Also, I was wondering how much did you initially invest in your CDs? Because from my understanding, interest rates are extremely low. I would appreciate any feedback to jumpstart my passive income/retirement plan! I invested in CDs when rates were higher. As they come due, I plan on reinvesting the proceeds. One is via Prosper, where I’ve been getting 7.4% a year for three years. If I knew that, I would have invested much more in Prosper. See: Prosper Performance Review. The second is real estate, where I bought a fixer in 2014, and rented out my old house. The other angle you can start is building up a dividend fund. You can buy dividend ETFs like VYM or DVY, which are low cost, and follow the markets. I’m using Motif Investing for all my non 401k investments b/c it only costs $9.95 to build a 30 position portfolio, and $4.95 for single stock trades. See: Motif Investing Review. Good job thinking about this stuff now! Consider finding employment first to earn and save. If you can find an employer who can pay for your grad tuition, even better. That is what I did, and that really boosted my wealth accumulation. So I am thinking about buying a 9 unit vacation rental property in Michigan. The property is for sale for 625000 and I know the seller so if we broker the deal with no realtors we could probably end up getting it for $600,000. Its currently yielding about 125,000 Gross and NET 70,000 in income (after they put new roofs on the cottages last year) . I reviewed the tax returns and business p&l so I’m pretty confident in it. Its currently yielding about 12% NOI. Which I think is amazing. What are your thoughts? Its managed via a paid property manager and is also set up with a website and vrbo listings. Family oriented Memorial Day through Labor Day. I’d love to hear what you think? I’m 31, Married, and a Baby on the Way. Can it be done? I’d like to be at $200,000 in semi-passive income by 2020. Currently we have about $300,000 in retirement savings between my wife and I. We also have about $150,000 in equity in our house. Our household income is right around $175000. Tell me what you think about this investment? Sounds so amazing that I question why the seller is selling? What is their answer? I have a question regarding the passive income generated from the P2P investment. 1. Is the passive income interest or does it include the principal being paid back? 2. I’m assuming you re-invest all the principal and interest to make the account grow, will you continue to do so when are ready to retire? 2) I do reinvest it all. Yes, I will continue to reinvest when I retire. I was retired from 2012-2013 for two years, and all I did was save and reinvest. It’s just habit. But it’s fun too! Man, 4% on that hefty CD is wonderful! Do you have a post somewhere outlining your dividend portfolio? Also equally impressive. You’re only 4 years older than me and you’re killing it Sam. I hate hindsight! Thanks. Why do you hate hindsight? It’ll just eat you up! In hindsight, I should have dumped the CD portfolio in the market and I would have made more! :) But, I do like earning 4% a year risk-free. It feels GREAT. I haven’t outlined my dividend portfolio. But maybe soon. 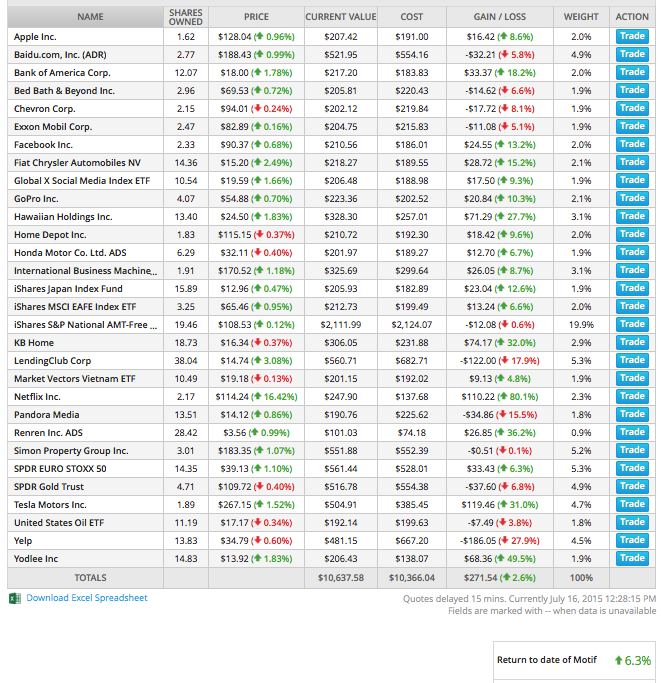 I have highlighted my Motif Investing portfolio here. I told you I wouldn’t do it. I had a newborn and a 2 year old and was recently promoted, so I didn’t need the money and didn’t have the time. I’m looking to take that advice now, and really start to build something I enjoy, though I do make more than enough at my day job now. It’s just not as fun as building a true challenge and accomplishing something rare, like your goal of $200k/year passive income. I remember that cab ride too! Crazy how time flies so quickly yeah? But also pretty amazing how much one can accomplish in that same time period as well. I would much rather take care of and spend time with a newborn and 2 year old. Family is #1! I have yet to meet anyone who makes $300K+ and works 30 hr weeks. I’d rather work part-time for less pay to see my kids grow up. But then again, I don’t go around asking what people make. Guess you’ve met your first! They are no different than anybody else, except they hustled A LOT to get there in the beginning. Regarding investing in a vacation home in Lake Tahoe, would you recommend investing in a 1 bedroom condo in Squaw valley resort? Assuming I put down 25%, would this rental be cash flow positive? I already 2 rental properties but would love to own a vacation home closer to where I live. Tahoe still has not caught up and is still below the 2006-2007 time period peak. Hence, if you love Tahoe, and are ok at managing, it could be a good idea. I bought tahoe for lifestyle b/c I planned to be there 2-3 months a year. Congratulations on your success! You have made so much progress during the period you referenced. I hope you appreciate your progress. I’ll be happy to see where you will be next year! Thanks Rick. Just come over to SF for vacation one day or peruse through the rental listings on CL SF. It’s just the way the market is now. Will probably last for three more years until the government shuts down or makes difficult more on-demand firms like Uber, Lyft, TaskRabbit, etc from operating. Homejoy just shut down after raising $40 million in funding over the past three years for example! Your passive income is currently much higher than most so even though you didn’t reach your goal just remember how much further along you are then most. As for myself I have hit all of my goals thus far this year which leads me to think that I made it to easy on myself and need to make it more difficult next year, or better yet upgrade this year’s goals. Maybe you are right. I’m basically challenging myself. I know plenty of people who make much more and less. I zeroed in on $200 – $250K/year as the ideal income for places like SF and Honolulu, to live a comfortable life, so that’s what I’ve been shooting for all these years. Congrats on achieving some of your goals! What are some? Definitely have a stretch goal that might be multi-year. It helps bring folks farther. Color me skeptical that $200-250K/y is *the* one Magical Maximum Happiness number for everyone. My experience so far is that each household has its own level of spending for maximum happiness, and that it’s rather smaller on average than this. I’ve seen it range from $25K/year to $25K/week, with no reference to levels of taxation or other external yardstick. My sense currently is that $50K/y will be plenty for my household. Heck, just your CDs, added to my current portfolio, would be enough for me to retire on! But hey, your number is your number, and you’re doing a bang-up job both getting there yourself and inspiring others to come along on the same ride …. $200 – $250K is THE one magical annual income number for max happiness Joseph! I’ve done careful written observations of income phases from as low as $3.65 to $800,000 and the $200 – $250K figure is the winner! The research scientists say the income figure is closer to $75,000. But, that’s because research scientists don’t make much more than $75,000! How can they really know? That is fantastic that $50K/year is plenty for your household. Being happy with less is being truly wealthy. Too bad things are so expensive everywhere I want to live! I think that would be interesting too. I know after I left my job in 2012, I mentally kept a spending limit at about $8,000 a month total and didn’t buy anything unnecessary. I think my expenses have actually gone down because my new home mortgage is ~$450/month lower, and my car lease is only $235/month and a business expense, especially with the addition of Uber driving. There aren’t any fancy clothes to buy, or frequent expensive meals to spend on. My biggest expense over the past 12 month was the $58,000 master bathroom expansion. I might calculate my numbers for this year. It’s strange though, b/c I don’t really think about a budget too much anymore. I save/invest whatever I can left over. If I feel too frugal, then I’ll just spend more. Everything is kinda excess b/c I’m a saver, and hustler. Saw your comment over at Jon Haver’s site and had to pop over to see your report. Even though you didn’t meet your goal, still impressive numbers! Even though you didn’t meet your goal, $175k is not too shabby! You have a very solid stash, congrats! I’ve been thinking a lot about my passive income as far as blogging is concerned. So far, we’ve only shared our annual expenses on our blog but never disclosed the income side of the equation. I’d love to track our passive income online and blog on how we’re getting to our FI destination but I still don’t feel comfortable with the idea. What has been your experience sharing your annual income online? Sharing the passive income journey has been fine, as the figures are within a middle class range e.g. $78,000 – $175,000, especially for a SF household. I guess I don’t share my expenses b/c they are more subject to criticism. Furthermore, my expenses are pretty boring for a single person or couple. I like to spend my money as I see fit, in private. So, we have an opposite outlook on what we reveal. Furthermore, I’ve maintained for the longest time that $200 – $250K/year is the ideal income for maximum happiness. Hence, my goal was to reach this figure through passive income to be completely free. Is the $200 – $250k for ideal happiness after tax or gross income? I love your site man. Posts like this are so entertaining and motivating. I’m going to be so upset one day when you decide that you don’t need to do this anymore. This is the best financial blog on the web, bar none. Thanks Matt, appreciate the kudos! I’d like to run this site forever b/c it is so fun! It also helps serve as a diary for me to read back upon when I’m old. Unless I get some 8 figure offer I can’t refuse, I’m keeping this site forever. Trying to earn lots of money from this site isn’t one of my top three interests. I’d rather just write, connect, and share. Despite my many attempts to have you “stake” an up an coming blogger, so you can achieve the 200K in passive income, I feel that this would have put you over the top, maybe this same venture will still happen in 2016-2017, one small blogger can only hope! I jest, everything looks great. I think the updated version of the book is going to put you over the top assuming the price strategy holds up which I think is a good possibility. Interest rates may increase but probably not enough to make an impact to a CD that is up for renewal, Real estate income should increase over time but mostly a few percentage points here and there, I suppose you could manufacture more income by paying off one of the rentals assuming your income numbers are after expenses and not gross income. I wonder if adding an app or selling the other 35 pages as a separate book to those who already have the original book. Almost like an add on workbook of sorts, just my flow of ideas as an outsider looking in. Great job, but I suspect you already know that! Investing in bloggers… a good idea! But man, blogging is tough, tough, tough work that takes a LOOOOOONG time to get going. Failure rates are high and just thinking of starting over makes me tired. I may very well write another ebook with a lower price point about specific topics. Makes sense to leverage this platform. 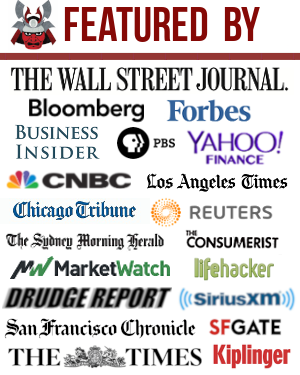 I can write about: life on Wall Street, investing in real estate, and generating online income, to name a few. I think I’ll just go do that. The books don’t have to be super long… like 50 pages each. Looks like your post production schedule is going well. Good job! Congratulations – you are killing it. 100% of my passive income is real estate, or secured by real estate. My other investments like retirement are diversified, but as as far as passive income goes, it’s hard to diversify when you only feel competent in one asset class! I think $200-$250k in passive income is on point. Although I have longer to go than you, I have enough to live above the poverty line on passive income alone – that helps me sleep at night! Definitely not a bad thing to invest in what you know. In fact, that’s crucial to developing passive income. Better than investing in things you don’t know! It just takes time. Like with Prosper, I’m now comfortable to build the position to $100,000 now. This post certainly drives home the reason we should set goals. When you have reach goals and achieve a high percentage of them, you are far better off than not have set any goals at all. It is funny how goals change. In my mid-teens I thought that if I could only have $100k put aside I could live off the 10% interest for ever. Now, my passive income number needs to be $100k per year to be at the comfort level we want. Fortunately we can easily live on half of that amount of income. I remember the same thing during college. If I could just make $100,000 a year, I’d be set for life! I think it’s still a good amount, but thanks to inflation, it’s not as I imagined 20 years ago. Very inspiring. I live in a smaller city now and planning on investing in my 3rd property. It is true that having goals makes us plan the steps. I like the way you are so organized. Baby steps become great progress in the future. GL w/ property #3! I’m slowly coming up on $12,000 passive….. I never have, and I don’t think I will! I’m pretty serious about sticking to a $250,000 annual income for maximum happiness. I’ve done the observations at various income levels, and happiness does not go up beyond $250,000. I’d rather share the wealth. Perhaps I’ll index the $250K to inflation though. I suspect my income could very easily fall off a cliff one day too, hence the consistent savings. Keeping an income limit helps force me to SPEND money earned beyond that level. I’m been very frugal for my entire life. The problem is, I still don’t spend up to $250K. Not even close. But, spending $58,000 on the bathroom helped. Nice job on $12,000 a year! What are the steps to putting money into a CD? I have never done it before and I am not super comfortable with it because the process seems complicated. Do you recommend putting money into a cd? Which amount do you think it is worth it and which amount is not worth the hassle? I am in my early forties and I have been thinking about putting money into muni bonds. Do you think it is a good choice to put less than 10% into a muni or state bond? 1) Walk into your current bank and ask to sit down with a personal banker. They’ll highlight the various CD rates and durations. Once you’ve chosen one, you simply write out a check to yourself, choose whether to reinvest the interest, or receive the interest as payments in a different account. 2) Go online and click through to the CD section. My three CDs are currently with USAA. You can then electronically wire funds to the account. Just ask about prepayment penalties. Each account is FDIC insured up to $250K per individual, $500K per married couple. In Canada we have a GIC that is similar to your CD. We get paid all the interest at the maturity date of the GIC and not before. Do American CD’s pay their interest monthly? You have it listed as a monthly income. Yes, my CDs pay monthly, and are reinvested into the CD to get some compounding. The alternative is to select the monthly interest to be sent to my checking account or savings account. The CD was/is a great way for me to never touch my money for the duration due to a prepayment penalty. Mentally, I knew that if all else went to hell, at least I’d have my CDs to help me rebuild. Even though you’re a bit short of your goal, I think this is quite amazing. $175k/year in completely passive income! I can only dream of that. My current passive income sources are primarily mutual funds. I would love to own rental property at some point in the future, perhaps keeping my current condo as a rental unit if/when I move to a house. I had a dream in 2000-2001 about one day reaching $100,000 as well. Dreams just take a long time to hatch, that’s all. Renting out my first property (Condo) after buying a house in 2005 was a key move for my passive income journey. I think it’s worth doing the same for you. Your passive income of 175K for a young single person is just incredible! My wife and I are both 50. 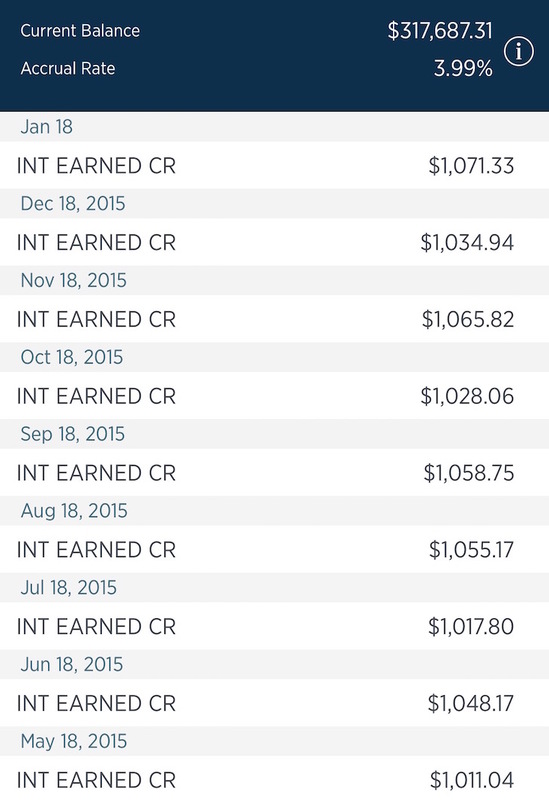 I am obsessed with generating passive income to cover all expenses in preparation for layoffs next year. We get 80K a yr from tax free muni bonds. Since we don’t have the stomach for the stock market and for tentants we only invest in munis. Our state is fiscally stable so we sleep well at nights. We will keep the 4-5% bonds until they are called or matures. Our future combined pension is 68k a yr at age 55. Our SS is 38K combined at age 62. Our current expenses is around 40K and our savings rate is 86%. Future medical expense will be an additional 20K if we are unemployed. The company wants to outsource all employees. We have been planning to be eliminated and I think we are good to go when we each get our severance of one year salary each. The plan is to sell the house. Downsize to a small cheap condo for a home base in a state with no state tax like Florida. Lock the doors and travel. Ultimate dream is to get to Hawaii Oahu. We dont think we can afford to buy a 2 bedroom condo in Waikiki. Maybe just rent a couple of months in Hawaii and in different parts of the world. Nice job making $80K in Munis tax free! I’m slowly leaning towards that route. Your combined passive income looks like it’s about $250K a year gross? With $40K a year net in expenses, that’s a lot! A 2/2 in Waikiki ranges from $500,000 – $1.4 million. Are you sure you can’t afford one? It also depends on how much you want a home base to be. Your excess cash flow is huge. Maybe best to have a home base in a no income tax state and then travel for half the year. Oh yeah, pensions aren’t state taxed in Hawaii! Thanks for replying, for the Hawaii post and for the pension tip. I did not know that pensions are not State taxed in Hawaii. The entire family is on the east coast so I still will need a home base to check on the old folks. Although our passive income will be OK, we dont have much cash. Even if we sell our house it would be 50% of a 1.4 mil place in Hawaii. We dont want a mortage ever again and we dont have any more cash to purchase a place in Hawaii. If we work in the company for another 5 years then our pensions would double at age 55 and we can then use the new savings to buy a place in Hawaii. Layoffs is supposed to be completed in 3 years for the entire company. I suspect we will be cut some time in 2016. I believe there is no way they will allow us to work till 55 to double our pensions. At 55, we also get 7 or 9K each for medical insurance which is another reason to cut us sooner. We will just continue to keep working until we are eliminated. We hope to work through 2016 so that we can build up our cash again. We recently purchased more bonds so our cash is lower. That is why we were thinking to use any money leftover from our passive income after expenses of 60k which includes medical to rent a place in Hawaii. We dont want to be house rich and cash poor. Owning a place in Hawaii with an ocean view is our pipe dream and it keeps us running on the hamster wheel! Sounds like a good plan! It must feel liberating knowing that you will be free by 2016 sometime. No need to take work too seriously, collect the paychecks along the way, and save all you can in the meantime! A fully paid off house or rent is the way to go if you’re really going to fully exit active money making endeavors. That passive income stream really is awesome you’ve got there. Rent for a while and see how it goes. Explore the neighborhoods like Kahala, Kaimuki, Hawaii Kai, Waikiki, and then go south west to find lots more value. The key is to enjoy the freedom and not let money bog you down. I think you guys will love the next chapter! Thanks for more great advice and about exploring other neighborhoods. Will do! The last time we went to Oahu, we loved staying in the Waikiki area. We drove all around the North shore and East. We did not have a chance to go West. We went to Hawaii twice and we LOVE it because it feels like home to us. We pretended to live there to see if we can buy whatever we needed. Wife and I love Hawaii food, poke and the restaurants there. Yes, we do feel extremely liberated and a lot less stress because we planned to be jobless. We started generating passive income 5 years ago when we saw the company changing. After we heard rumors of re-orgs and layoffs, we were forced to do something. We feel bad for our co-workers. A lot of them still have mortages and kids to support. Some went on interviews and did not get a call back. We are thrilled that you think our passive income is awesome! We are lucky to have a pension. The first time we saw your passive income breakdown a year ago, our jaws dropped! We are so impressed with the massive amount especially your rental income. It is very smart how you diversified the income to protect yourself. You did a fantastic job to create a profitable website to help people! Yes! We are looking forward for the next chapter. Freedom will taste good since we hate our jobs for SO many years. Golden hand-cuffs. We can only hope for good health. Incredibly close to a pretty lofty goal! I’d be pretty happy if I could generate that much passive income in that time frame. I’m more amazed by the monthly rental rates on your income properties. That market place blows me away with how inflated the prices of homes are. It’s all relatively Stephen. San Francisco and Honolulu are expensive, which is why I aimed for $200,000. If I lived anywhere else, I’d probably shoot for $100,000 and call it a day. RE is expensive here. The good thing, if you are an investor, is that it seems to keep on getting more expensive! Who spends $100,000 a year on rent? Glad to see you’re boosting your Prosper account. Only took 6 years, eh? ;) I was reading down this post thinking, “Prosper would be a huge win here.” Then you covered it. Well, it only took about three years, since I’ve been investing in P2P since 2012. But, it’s taken six years to actually start putting a larger chunk of change in it. How much do you personally have invested in P2P? I’m also more interested in P2P now b/c interest rates have been rising. So at the margin, the investment return should increase as well. Over the past six years, the advertising investment return rate went from like 10.6% down to 8%. Congratulations- you are just killing it. Not sure if I’d include the tax deferred account passive income into the mix since you don’t have access to it without penalties for another 20 years. But you are doing so awesomely all around, that this doesn’t really matter. I’m basically slightly above where you were in 2012, and to get to where you are today in 2018 seems quite challenging, but I’m up for it. Yes, including my ~$10,000 a year in dividends from my tax deferred accounts are a grey area. I look at it as passive income that gets to compound without ever being touched for 21 more years. After all, I have a choice to contribute my ~$50,000+ every year into a SEP IRA or just in an after tax account. If it makes folks feel better, I could include 10% of my site’s income as passive that would more than cover the tax deferred income, but I don’t. I’ll try to hit Vietnam and Thailand next year or the year after! So hot! Interested to know, does the dividend income monthly and yearly figure include all investments or just the 10k you have specifically in not tax impacting accounts? I think a while ago you asked me, “Does this site bring in any revenue?” That made my day! It is truly one of the best compliments a writer/blogger could ever ask for. Oh and I forgot to ask… what happened to the guest post earlier this week? (deleted) Did he not like my question about Warren Buffet handily winning the hedge fund bet using simple index funds? No idea, sorry. But, you’re welcome to write a guest post if you want on the topic! You are correct in that I’m passed the $200 – $250K sweet spot, which is why I’m actively reducing my income by hiring people to help me with editing, accounting, operations, web design, site maintenance, and so forth. I’ve also got a charitable giving process in place. At $175,000, I need to make an $75,000 through consulting or online income to get to my sweet spot. There’s a reason why I’m no longer consulting much at all anymore. I really believe in the $250K number, and I’ve stepped the foot off the gas pedal as passive income has grown slowly over time. Everyone should use passive income as a way to fill in the GAP to their personal income sweetspot. Even if one is generating just $10,000 a year in passive income, that might be the difference between working a job you hate, vs a job that is interesting! I like that perspective of filling in the ‘gap’ – something I’ve been considering exploring vs earning as much as possible and growing the investment pot, but still not a straight-forward decision. You are getting so close. You mention that you don’t include your blog income because it is not really passive. Have you or do you have any plans to share what a blog of your size, age, and consistency could produce. I always like benchmarks and things to work towards. Not a lot of people share their numbers out there. I might publish a post on how to start and grow a profitable personal finance blog one day. In fact, I’ve got one in the queue. I just don’t know how relevant it is for the FS audience. I had a survey question once, and only a minority of respondents cared to learn about generating online income here. The feedback from my Ranking The Best Passive Income Streams post has a lot of doubt about creating a product to create revenue. Perhaps if I write a post and help show the way with the FS community. Starting a site is so easy nowadays. Given the site’s ranking in Alexa, and the niche, I wouldn’t be surprised if this site makes somewhere in the low six figures yearly. Also, if you stopped blogging, the money wouldn’t stop coming instantly, so a “part” of it is passive IMO. So this post opened my eyes once again on financial matters. This article taught me the value of diversity and trying things out with small amounts of money until comfortable. 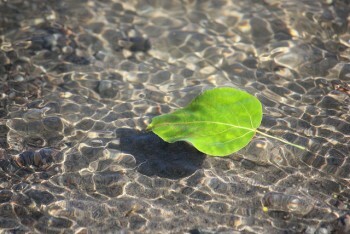 I am tiptoeing into the waters of investing after receiving some inheritance money. I have trepidation about what to do with it and how to slice it up. It’s only about $150K but it’s a good start. I am considering buying the three apt unit that we live in which would take about two thirds of it when all said and done. I would then lock in the 4% even after we move out in a year or two which I am told is a good rate for commercial investment. My question is am I starting too small and should see if i can get a larger apt complex or even a mobile home park since most of what I have will be locked up in it. I have a very busy day job right now with not a lot of time to put into managing a property or fixing it up to any large degree. Ideas anyone? Brett – $150,000 is a pretty good amount of money. That’s $150,000 more than I’ve ever inherited! But, that’s also inline with the average inheritance amount in the US. If you don’t own your primary residence, I would at least get neutral the real estate market by owning your primary. How long have you sat on the $150,000? It’s good to sit on it for six months or so to really think through your options. Some folks have a tendency to try and spend/invest it ASAP. I’d probably invest the $150,000 into RE, P2P, and a balanced stock/bond portfolio with six months of expenses in cash if you had no other cash. thanks for the reply, I appreciate it as well as the no nonsense transparent and knowledgeable views shared on this site. I have been sitting on the cash in the bank for about 3 months now and feeling a bit silly for not doing something with it but am glad now that this investment in our 3 unit apt. house has arisen. PS – I bought and downloaded your e-book of the highlights from the blog but somehow can’t find my copy of it. Is there a record of the purchase so I can download it again? Just for clarification, you include your passive income in your tax-deferred accounts even though you cannot readily (or easily) access those accounts at this time? Indeed I have. It’s not much at ~$930/month as my pre-tax portfolios are growth oriented. I include them because it’s real money, and I can either save $50,000 in a SEP IRA, or invest in an after tax account even more. I should invest in more income generating investments in my pre-tax accounts though. I like the idea that this money will compound, and I will never touch it for a couple more decades. In fact, I spend very little of the passive income here. Most is essentially plowed back into the investments. * Any asset which has a high expected return and is tax inefficient should be sheltered in a tax deferred or tax exempt account. These include REITs, high yield bonds, and stock funds with a high degree of short-term turnover. * Assets that are high growth but tax efficient, such as long-term stock holdings and equity index funds, should be added to a taxable account. Dividends and capital gains from these funds are tax advantaged, and the funds themselves can be used for tax-loss harvesting, further lowering your eventual tax bill. FS, well-played, sir! Your numbers look great and am in admiration of your progress towards your goals (both financial and personal). One thing I admire about your growth in the pre-tax portfolio, is the consideration that all your dollars are fungible. It would be just fine to spend a dollar of post-tax principal as long as your post-tax investment grows to replace that dollar. Some may have the mistaken idea that you are limited to ‘which dollars’ you grow/spend, but you have an ever-growing nut that removes that artificial hurdle. Continued success to you. Fungibility is a good word to discuss! Fungibility is the key reason for the post, The Emergency Fund Fallacy. Folks should check it out. Don’t think in EF terms, it will only give you a mental crutch! your words “I can either save $50,000 in a SEP IRA, or invest in an after tax account even more.” Are you paying yourself 200k as salary? Or what is the trick? Man, those are huge numbers. I’d call that a win regardless of getting to the $200k or not. I’m failing horribly at my public goals this year, mainly because my private goals – starting a family – are much more demanding, and satisfying than my financial ones. Ah! Sounds good. Private goals are more satisfying here as well. Very interesting! I have no useful knowledge about Business Development Companies, but I’ll keep the ETF, BIZD on the radar with the 8% yield. BDCL is a 2X leveraged long, which is down 20% since last September. If I dumped $500,000 in that then, I’d be extremely pissed off. I want 100% principal protection with the slice of money. My CD portion of my passive income is my Risk Free portion where if all else fails, I still have the CD income producing $20,000 a year and guaranteed under FDIC insurance. I used to have much more, but I deployed several hundred thousand last year on my home purchase. If you’d like to write an article on BDCs, I’d love to have it! Congrats on continuing to reach for your goal of 200,000 a year in passive income. That is very impressive and what is even more impressive is that it is spread over many different asset classes. Hopefully in 15 years, I can have a portfolio like yours. While it may not be as large, I hope to have exposure to different asset classes and be growing my wealth in an appropriate and consistent manner. For your “Passive Income Recap” section, #2 states that you should have money in Treasury Bonds, and I notice that you don’t. Is there a reason for this? Are you waiting for interest rates to go back towards historic levels? You had CD’s that had better yields than the current 5-year Treasury rate, so it makes sense, but I’m just curious. Thanks. If you don’t live in San Francisco, NYC, or similar expensive cities, your passive income portfolio definitely does NOT have to be as large. It’s funny about the $200,000/year figure. The SF Chronicle (our local main paper) just came out with an article saying Family Needs $200,000 A Year Comfortably To Live In San Francisco. My gut instinct was spot on. I have money in Treasury bonds in my after-tax portfolio and some in my pre-tax portfolio. It’s all blended in there. Setting goals make such a big difference. Sometimes we hit them and sometimes we don’t, but they definitely drive us forward and push us to do more than we would without them. I had a conservative net worth goal tracker that I created a while ago and have surpassed what I wanted to have in my mid-forties a decade early! I’m still working on growing my passive income streams to supplement my active streams. Your progress is very inspiring and I think it’s really fantastic you’ve come as far as you have even though you came out under your target. Thanks for encouraging all of us to set goals and grow wealth. And congrats on your progress so far and into 2016! I completely agree with your stance on setting goals. When you sit back and think about what you want to do, it is more like day dreaming than actual planning. When you set your goals and stone and define action plans, the goals seem much more real and you work harder to attain them. There is a sense of pride and responsibility when the goals are on paper. No problem Sydney :) The key is to just start somewhere. For example, when you rolled over your 401k into an IRA, how amazing was it to realize how much more you had than you thought? Small steps lead to big results over time. Just got to be patient!